It's been a challenge for me, but I think I did it. 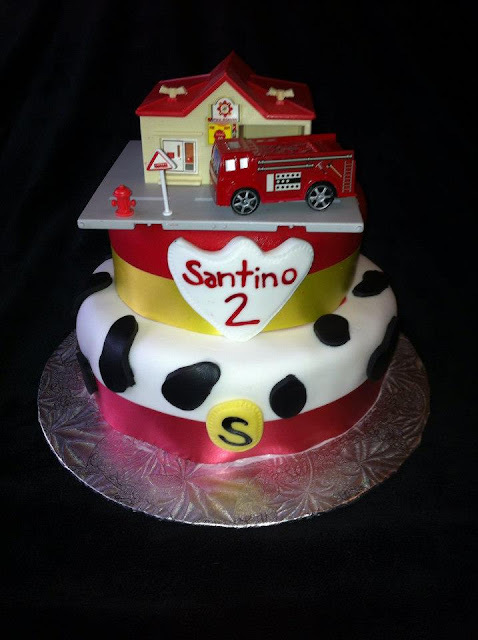 I had a few ideas on what to do for Santino's 2nd birthday party, I followed through on most of them. Here's what I did, and here are my recommendations based on what I learned. I knew I wanted to do a small playdate-like party for Santino, just with a few of his friends. I wanted to make it a theme party, just for fun and also to give me a better direction for my ideas. I am a kind of person who can't just create something something. I need a theme, a direction, some kind of constraint. Then it becomes easier somehow, just because so many options that otherwise overwhelm me, get cut off and I can stay on track. A few months ago I thought I would do a Bob-the-Builder theme, but Santino's recent new obsession with fire trucks gave me a new direction. And that pretty much covers the basics. You can also add decorations here, but I didn't go as far as purchasing fire truck balloons or banner flags, and decided to keep it simple. So here is a play-by-play of my planning and executing. I opted for a simple and free invitations, so I used email to send them out. I made a digital photo, wrote an invite and gave it a little design in photoshop. And here it is, my own fire truck theme invite! I specified the date, the time and the length (I made it early morning, more suitable for toddlers), and I also mentioned that second hand gifts are welcome: we welcome the Reduce-Reuse-Recycle idea in our house. Plus, I realize that all these toddlers' moms are stay-at-home, the incomes are limited, and I didn't want to obligate them to buy expensive gifts. Santino doesn't care if its new. He will appreciate any truck or a book about trucks, and that's what I said on the invite. I didn't want to have a bunch of unmanageable toddlers high on sugar running around and bumping in each other, plus I don't promote sugar snacks in our home, so I arranged various fruit slices on pretty plates on a small table. I added toddlers' favorite fish crackers and home made mini carrot cakes. My original idea of "design your own topping" didn't come to life due to various reasons, but toddlers were happy with just the bite size cupcakes. I put lots of carrots, also added butternut squash, nuts and raisins, and put only half the sugar as it is required by the recipe. I did think of a few fire-truck-themed games, but they all involved water, so required being outside. I realized that would have been too much of a mess, and decided to keep it simple, just playing downstairs in Santino's toy room. 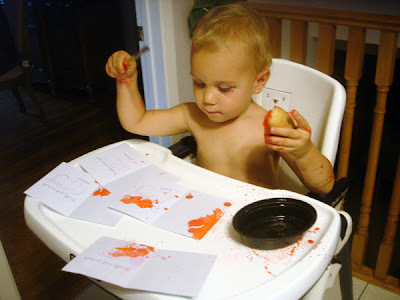 It was not that well organized, but toddlers didn't care. Whatever toys they had to play with, they spread all over the room, making such a mess, that I thought I would never be able to clean it. It did take me a few days after the party to finally sort everything through properly. I turned on some nursery rhymes music, hoping they would dance and sing, but they were too busy. One mom said, in reply to my concern that I didn't have any special games for them, "them just playing like that is fine; I actually wish this how it would be the whole time". And she was right about that. I had purchased 3 "tunnels" for the kids on a garage sale. They loved playing with those. I prepared some puzzles and some stacking toys, but they were not in demand. Morning party for the 2 year olds was filled with more active games. A few nights before, I put together a playlist of fire truck videos and had it playing continuously in another room. I figured, that at some point the kids will get tired of each other, and some will want to calm down and would love to watch some videos. Santino can watch fire trucks on TV for hours, so it was more interesting for him, that for other kids. 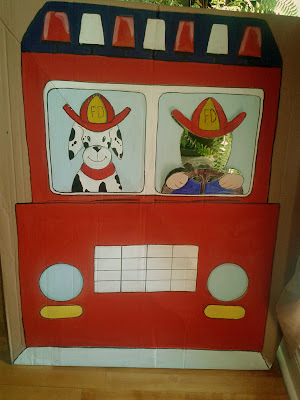 I also painted a fire truck mock up with a cut out for the kids to stick their face in and take pictures. We kinda skipped this, not everybody was ready to play with this cut out the way I thought they would. Santino loved it though. An hour after the start of the party, we brought the cake, made by Connie of the Perfectly Planned Parties. I looked great, complimenting the fire truck theme, and the simple vanilla taste pleased the kids. Everybody loved the cake. 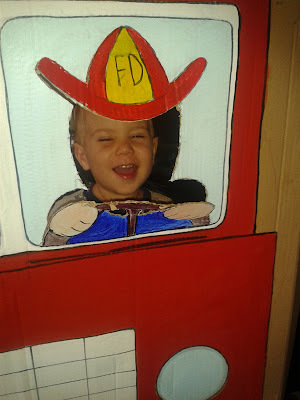 Santino loved the fire truck, that came with it, but didn't like the happy birthday song, started crying for some reason. This project was a mind twister for me. I didn't know what to give the kids as a "thank you" for coming. Buying fire trucks for everybody seemed too expensive. I got the stickers, which is a great bribing tool at this age. And what else? 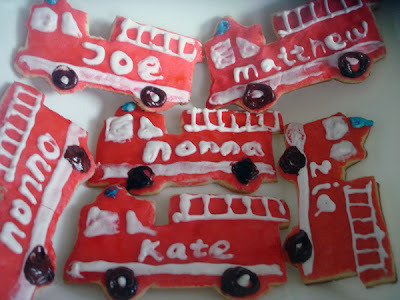 I finally came up with an idea: fire truck cookies! I didn't think it would be too hard to bake such cookies, but the decoration part was going to be a tricky one. I found a cookie-cutter recipe online. This one. It worked great for me, who was baking such cookies for the first time! I'm sure it will work great for everybody. I didn't have the fire truck cookie cutters, so I made one. 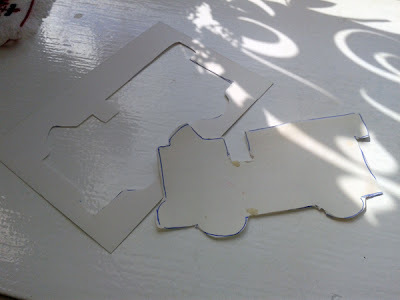 I drew a simple shape on a card stock, cut it out, and used to trace on the dough! So simple. I found, that this will work great only on the almost frozen dough. If you start cutting soft dough, the edges will be very rugged, not clean. For decoration, I mixed up some icing sugar (just regular sugar, blended in a small blender, the "Baby Bullet" one; if you don't have Baby Bullet, you can use coffee grinder) with water and some red and yellow icing food coloring. That made the red color of the cookies. To paint the details, I made some merengue icing, and then I just popped the cookies in a warm (not hot) oven for about half an hour, to harden the icing. The oven shouldn't be too hot, as the whites can change the color to brown, and you wouldn't want the cookies to become too hard. For the "thank you" cards, I decided to give Santino an opportunity to participate in making this project. 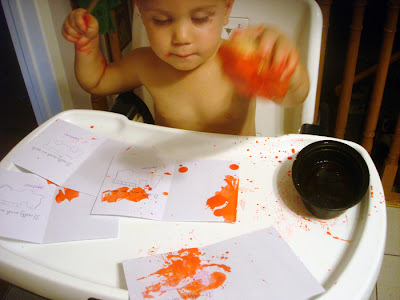 I mixed up some red food coloring with water and added sugar to thicken the mixture, and gave it to Santino. I also cut out a fire truck shape in a potato, in an attempt to make a stamp. The stamp would have worked, if he didn't start slamming that stamp on the cards so hard, that the shape disappeared quickly. 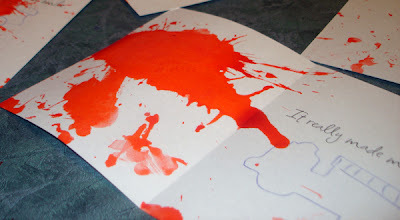 Here's what we achieved as a "thank you" card, signed by Santino. So, here is a little report on Santino's 2nd birthday party. I already wrote it once, and it got erased by Santino himself. It took me a while to find the time to sit down and write it all over again. 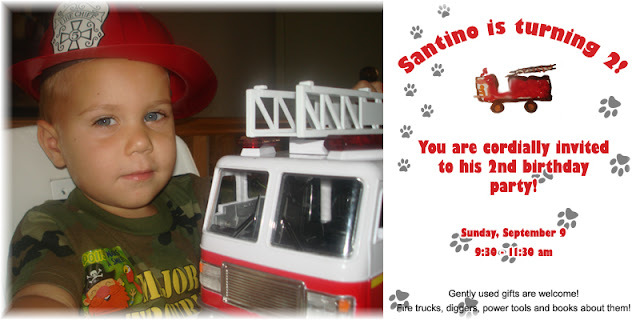 I enjoyed preparing this party for Santino! I wish I knew what I was doing better, but I will try again the next year! After all, there are many more Santino's birthday parties to come!